Banja Luka or Banjaluka is the second-largest town in Bosnia and Herzegovina, right after the capital Sarajevo. The city is also considered a capital, but, in this case, the capital of the Republika Srpska (Republic of Serbia). 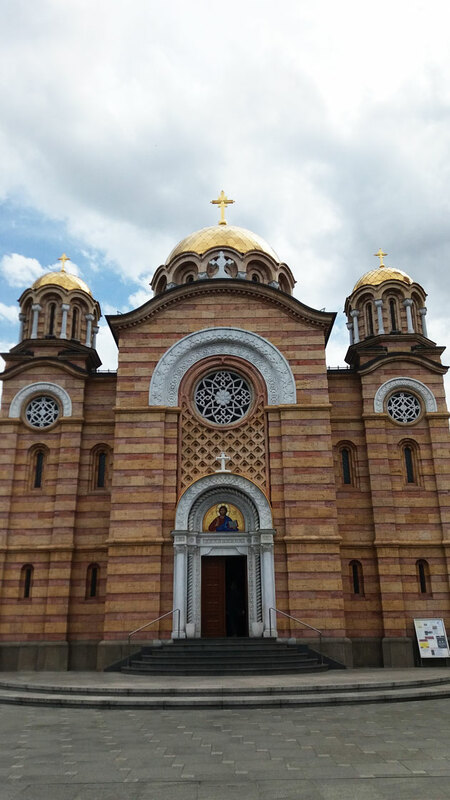 You can visit all the main spots of Banja Luka in one easy going day. Here are my suggestions for the best of tourism in Banja Luka. This stunning Orthodox Cathedral marks the center of the city. It’s a beautiful building from the outside, but just wait until you get in! 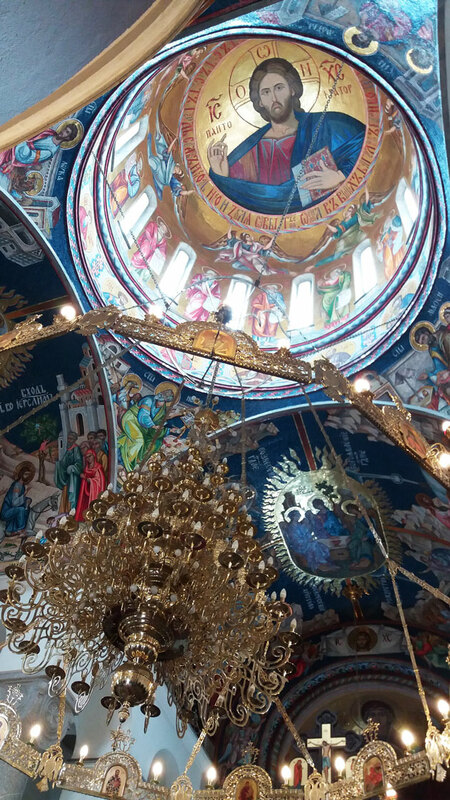 The Cathedral is definitely the most beautiful Orthodox Church I have ever visited. It is full of colorful mosaics, and details. Take your time to see everything peacefully. And pay special attention to the dome and its incredible chandelier. I was very surprised that in the middle of a working day, lots of local people were entering the church, and making their prayers. You could see that were young people coming from school or university breaks. At the same time that were older people visiting at their lunch break. It was clear that religion still plays a very important role in the city. If you have the chance, don’t miss the Church all lighted during the night, it is also a pretty view. One of the fascinating things about Bosnia Herzegovina is the fact that different nationalities, cultures, and religions coexist. This is visible in most of the cities of the country, like Mostar, Sarajevo and also, in Banja Luka. After visiting the Orthodox Cathedral in the heart of the city, walk around the center, towards the Tvrđava Kastel, and you will see the Ferhadija Mosque. The traditional details all over the building are visible already from the outside, but make sure to have the complete experience. You can enter the property to take a closer look at the stunning architecture and the flowers around. If you wish to go inside, make sure you take off your shoes. If you are a woman, you can cover your head with scarfs that are inside the Mosque, on the left side. Inside the Mosque you will have another peaceful experience. The floor is completely covered with carpets and, beautiful stained glass windows, making the atmosphere very comfortable and calm. 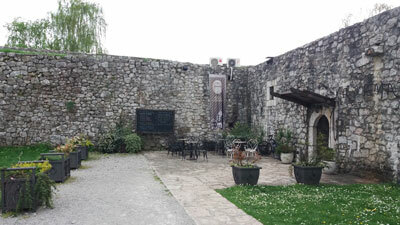 Right beside the Ferhadija Mosque, you will find the Tvrđava Kastel or Kastel Old Fort. The fort is medieval, but it stands in the same place where were discovered substantial evidence of the Roman Empire. 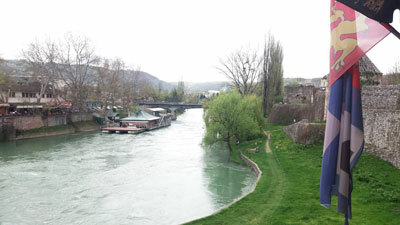 The fortification is on the left side of the Vrbas River. The entrance to the fortification is free. Inside you will find a small kids playground, a cultural center, and a restaurant. 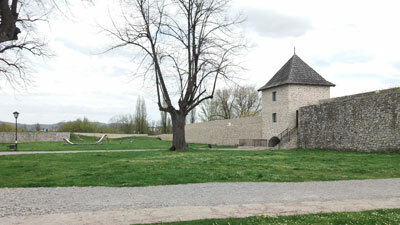 If you climb the fortification, from one side you will see the center of Banja Luka. And on the other side, you will have a beautiful view of Vrbas river. The restaurant Kazamat, is the only one inside the Old Fort. It has an amazing decor, all with medieval style. And if you take a closer look, you will notice that some of the walls are the real walls of the fort. Besides the amazing medieval atmosphere, the terrace has a beautiful view of the Vrbas River and a very nice staff. But of course, let’s talk about what matters: the food. 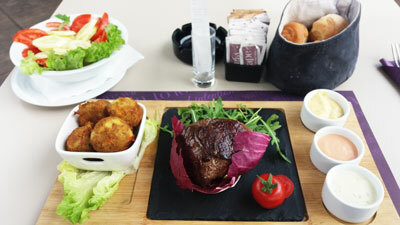 The food in restaurant Kazamant is amazing! The outside kitchen is surrounded by glass, so you can see the whole action inside. And everything that comes through the door, makes you wish you had more and more space on your stomach. We ordered the veal with potatoes baked under the bell and it was fabulous! As a dessert, we choose a different version of the traditional Baklava. So the dough was like a Baklava but it was wrapped in a roll with plums inside. If you like plums is a good choice. But I must say the original baklava is still my favorite. The prices are a bit more expensive than if you eat somewhere in the city center. But considering the quality of the food, the ambient and the fact that you are inside a medieval fortress, is still very worth it! Let’s say that the prices start at 15KM (+/- 8,00euros). Bosnia and Herzegovina is known around the Balkans as one of the best culinary of the region. Considering that, Banja Luka is known in the region as one of the best places for the traditional dish: Ćevapi or ćevapčići. 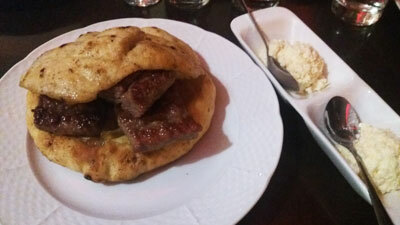 Ćevapi is a grilled dish of minced meat, a type of skinless sausage. It can be found traditionally in the countries of southeastern Europe (also known as the Balkans). You will find it basically everywhere in all the Balkan countries, but they all agree that in Bosnia, they are the best. We were visiting the city with a local friend and so, she brought as to a local restaurant. Since I believe the best kind of tips are always from the locals, here is the 4th place you can’t miss in Banja Luka: AeD roštiljnica (AeD Barbecue). We ordered the original Ćevapi. Here they come in 3 different sizes, small, medium and large. We had about 30 friends in the restaurant and no one ordered the small one, so, believe me, and go from the medium to the big ones. You will not regret it! Make sure to order the traditional “kajmak” with your Ćevapi. Kajmak is a creamy dairy product similar to clotted cream, made from the milk water of buffalos, cows, sheep, or goats in Central Asia, Balkan countries, and other regions. Your dish will be served like this one on the first picture. The cevapi (the meat), the lepinja (the bread) and the kajmak on the side. 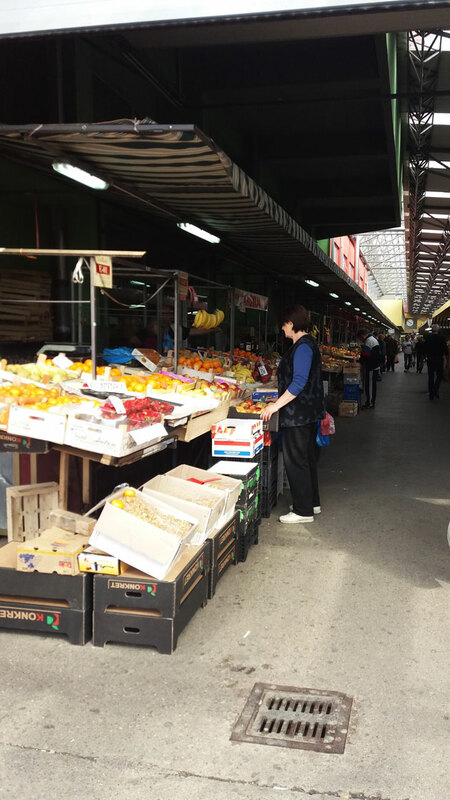 The cevapi are from 3.60KM to 6.60KM (+/- from 2,00euros to 5,00euros) depending on the size and the side dishes. 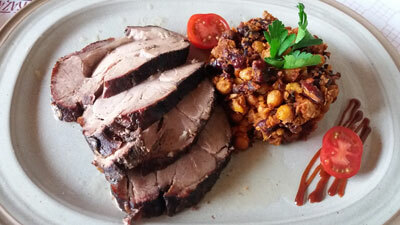 The other dishes are respectively from: Agape in the city center and Kazamat, inside the Banja Luka Fortress. You’re Welcome and Bon Appetit! As a city that hosts a University, Banja Luka has a nice nightlife with many different options of bars, pubs, clubs, and discos. I will recommend the ones I visited and liked, both of them are pretty close to the center, so you can just stroll around. 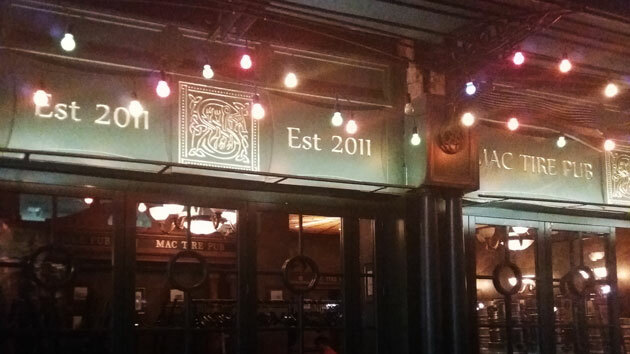 Mac Tire Pub has a classic Irish Pub style. The place is big but also famous, so you will always find people there. It was full but comfortable, not crowded. The band was incredible! Playing some old international rock. If you like beer, try the local beer Nektar. 2,00KM (1,00euro), 3,00KM, (1,50euros) 5,00KM (2,50euros) – (0,30liter l 0,50liter l 1liter). 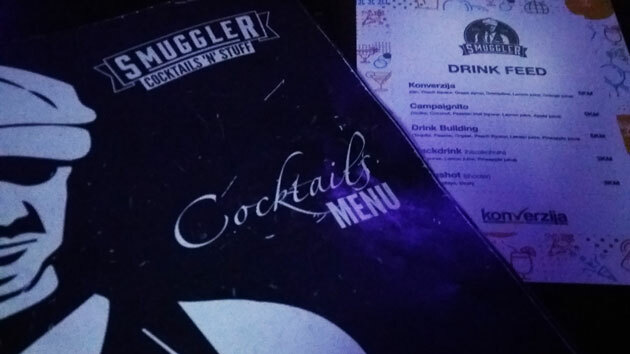 There is also a nice cocktail bar called Smuggler, also pretty close to the center square. They had a very nice DJ playing some old famous songs and we had the best time. They do have a lot of options for cocktails. As a Brazilian that is always homesick for her own food, I order a Caipiroska and it was pretty great. But they do have an extensive list of drinks. The cocktail prices are around 6KM (+/- 3,00euros). They also have a very nice terrace, so I believe during summer it is a heat! As normally travelers and tourists like some free time to shop and check some of the local products, I couldn’t forget to mention it in here. The main pedestrian shopping street in the center of Banja Luka is right in beside the Orthodox Cathedral and is called Gospodska Street. 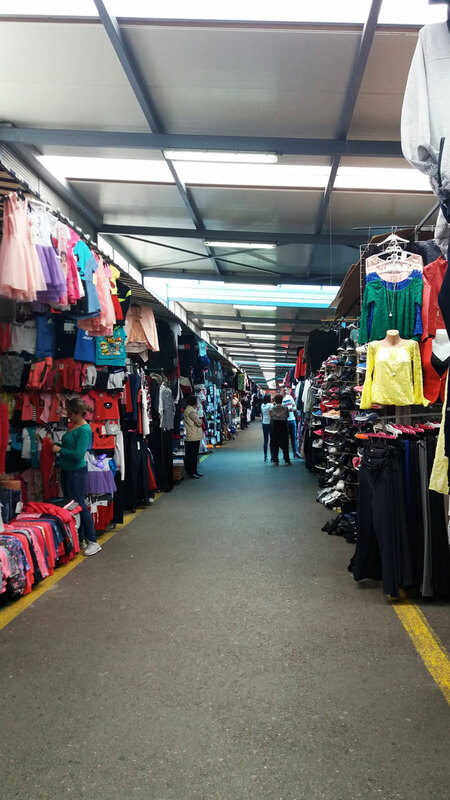 There you will find lots of different shops mainly of clothes and shoes. On the end of this street, you will see a large building called Boska. It’s like a shopping center with shops, cafes, and restaurants. On the last floor, you will find restaurant Agape. I had a delicious lunch there on their terrace. So I definitely recommend it. And the prices are really okay. During the evening and night, it also becomes a club. If you are traveling by car from any other country and entering in Bosnia Herzegovina, make sure you have the “Green Card” of the car, with you. This document is necessary and obligatory at any BiH borders, and if you don’t have it you will have to pay a fine. Rented cars also must have it. So while reserving your rent a car, make sure to tell the agent where are you going, so they can add this document for you. MarzitoTip: If you are in Croatia or Slovenia, and decide to go for Dubrovnik, for example, through Neum border, you will also need this document. Even though this is a “funny border”, make sure to read about the legislation before. If you are in Croatia, like Split, for example, and will travel to Dubrovnik, you will have to get out of Croatia, enter in Bosnia, get out of Bosnia and enter in Croatia again, to then, reach Dubrovnik. So pay attention to this green card on the car and also, to your passports, because this is a real country border. The city is home to the University of Banja Luka as well as numerous state and entity institutions of Bosnia and Herzegovina. The city has around 200.000 inhabitants. Banja Luka lies on the River Vrbas and is well known in the countries of the former Yugoslavia for being full of tree-lined avenues, boulevards, gardens, and parks. The locals use the river for swimming during summer time. But be aware that they do not consider this river recommended for beginner swimmers. The Vrbas is a very fast river with strong currents. So be sure to swim in areas with more people and ask for local advice before jumping in. The local currency is called Bosnia-Herzegovina Convertible Mark, Marka or Maraka, KM. Marzito Tip: Be aware that you will have an immersion in Cyrillic alphabet. Basically, everything around Banja Luka, especially in the streets, is written in Cyrillic. So here, knowing how to speak the language helps, but is not enough. If you rent an apartment, make sure to check with the owner how his surname is written in Cyrillic, so you can know in which door to ring on your arrival.